Zc701. 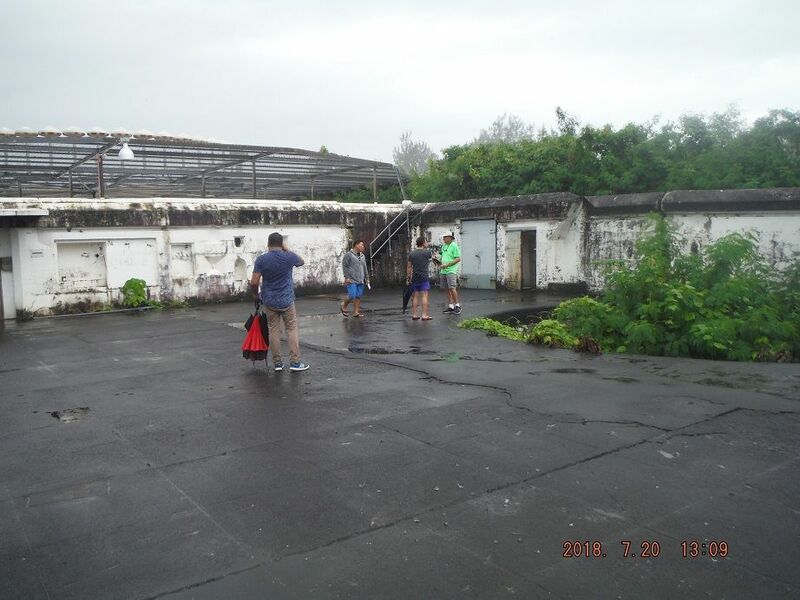 This is Grande Island, the former Fort Wint, in its heyday as a Navy Recreation Center. A battle ship and an amphibious ship are passing each other in and out of Subic Bay. On the island, left side and up is Battery Warwick, the two 10 Inch guns have been removed already at this time. 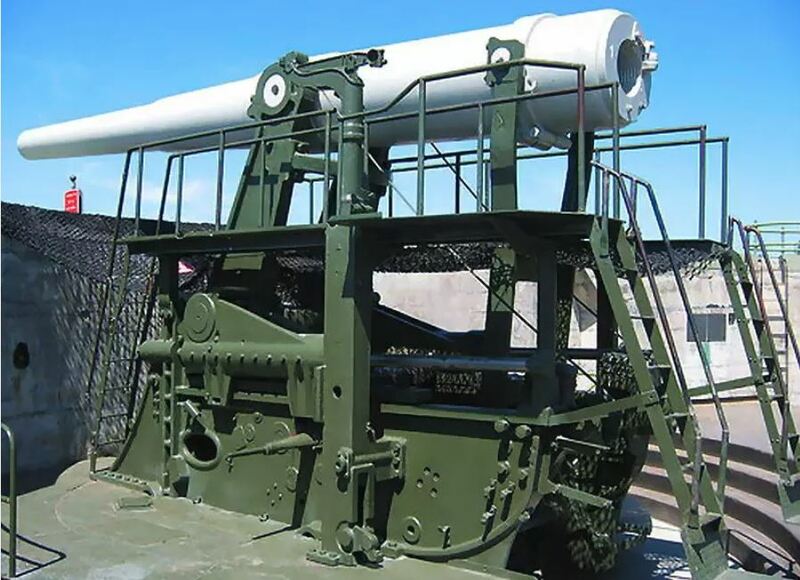 The 10 Inch guns, Battery Warwick, Grande Island were dismantled in 1968 and were shipped to the former Fort Casey to replace the 10 Inch guns there. 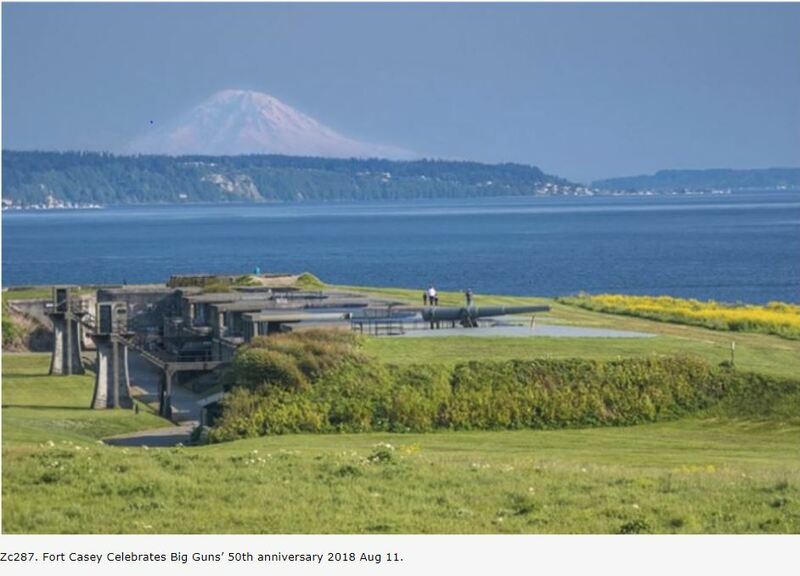 The former Ft. Casey is now managed by the Washington State Park Administration and a few weeks ago they celebrated that they received these Big Guns from Subic Bay 50 years ago. I have a personal angle to this story for several reasons. Subic Bay is my home now and I visited Grande Island many times to explore its history. Before the Navy ended up with it, it was Fort Wint, part of the U.S. Army Coastal Defense Command. In 1968 a Navy team dismantled the two 10 Inch guns and one of the Navy volunteers was my friend, HT1 DV then and now Charlie Moser HTCM DV USN (ret). He also was invited to speak at the 50th Anniversary of receiving the guns at Ft Casey. He gave me several pictures of dismantling the guns that he cut out of the Cubi Point Naval Air Station news paper The Afterburner, dated 1st of March 1968. 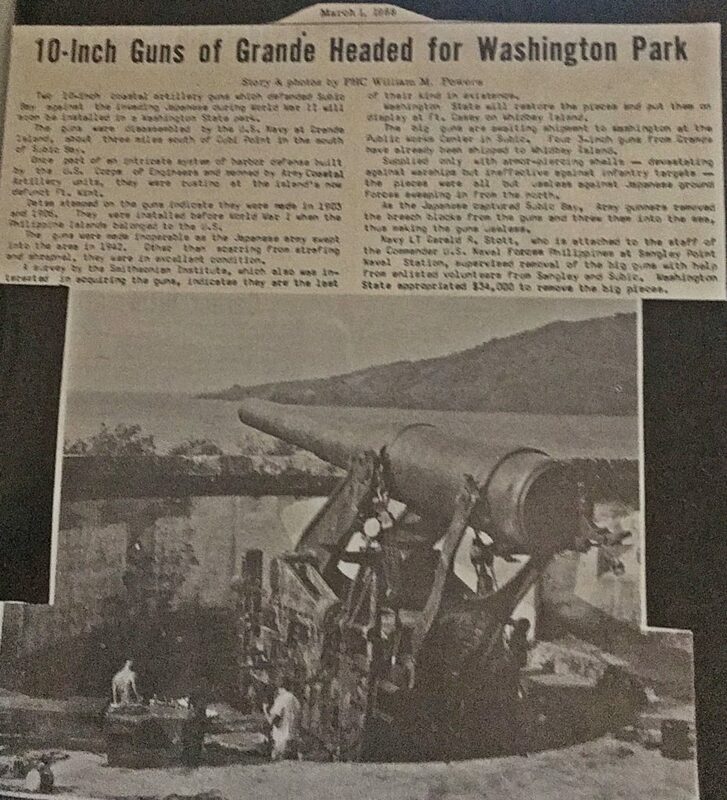 This is page 9 it covers the 50th Anniversary celebration in Ft. Casey of receiving these Subic Bay guns 50 years ago, click here. Zc702. 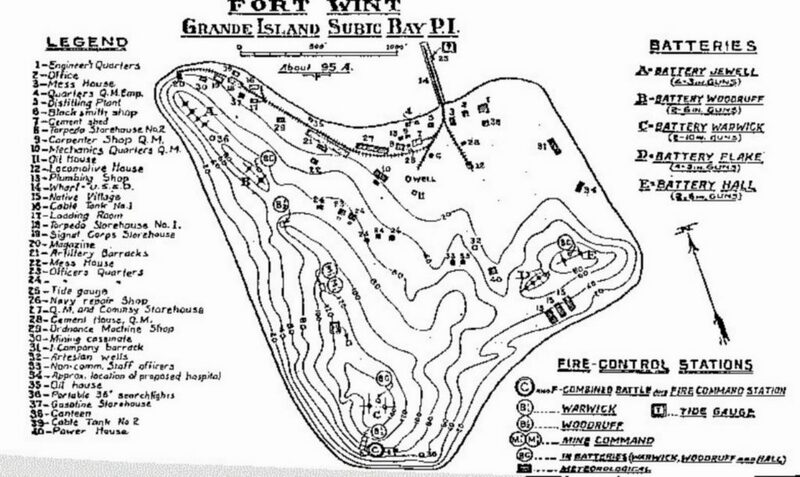 Grande Island was Fort Wint before WWII and here is a facility map of this U.S. Army Coastal Defense fort. Zc703. 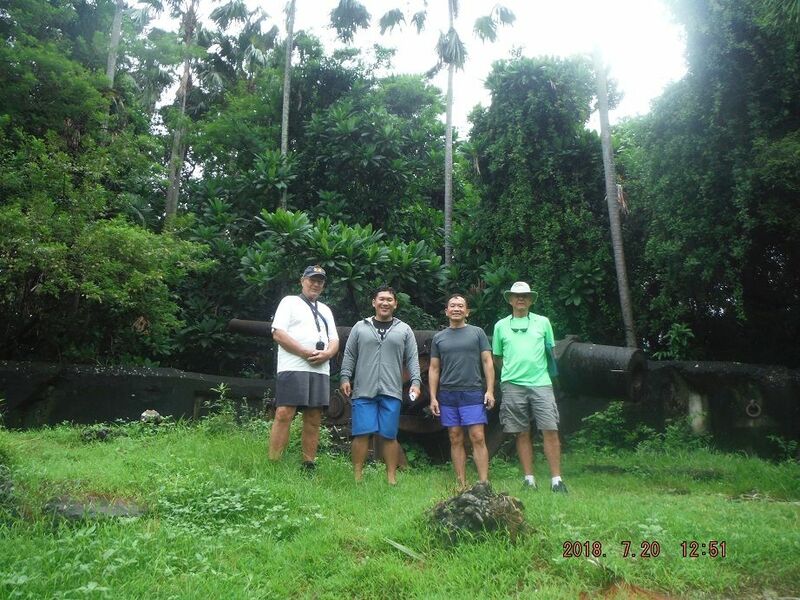 This is one of the two 10 Inch Guns on a disappearing carriage of Battery Warwick in the former Fort Wint on Grande Island, Subic bay. Zc704. 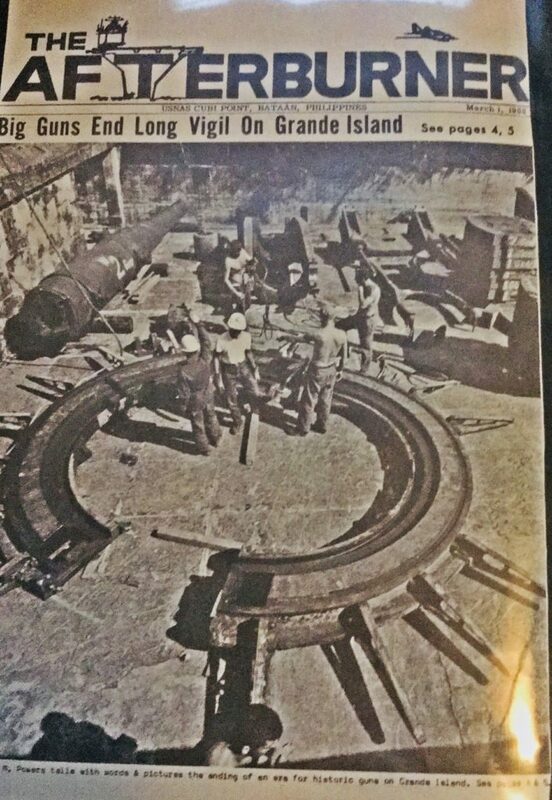 This is the article about dismantling the 10 Inch disappearing guns of Battery Warwick on Grande Island in Subic Bay dated 1st of March 1968. Do not try to read it; a better readable copy is following. Zc705. 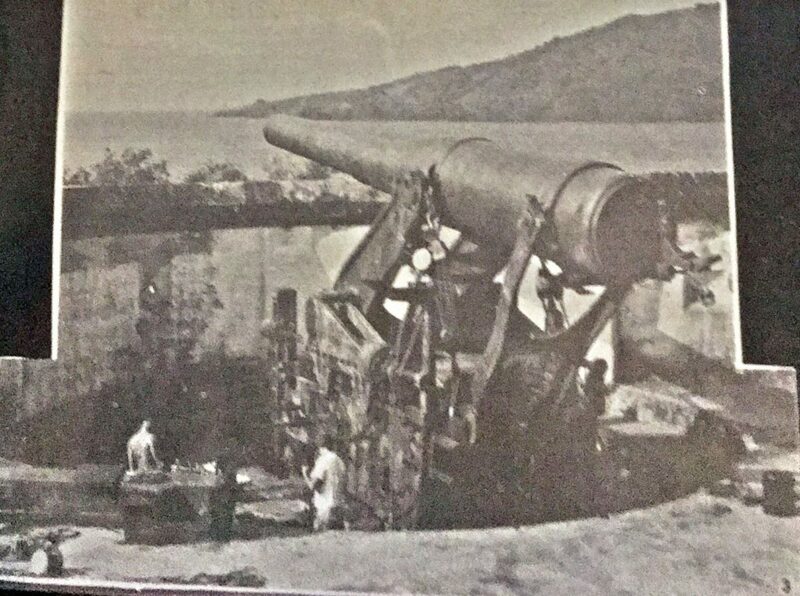 This is the picture of the 10 Inch disappearing gun of Battery Warwick on Grande Island in Subic Bay dated 1st of March 1968 from the previous image. Zc706. 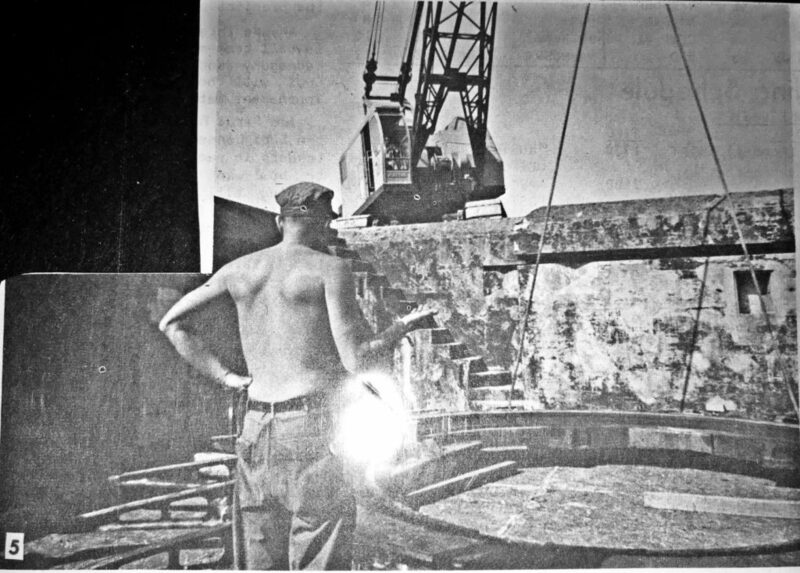 This is the readable copy from the article about the removal of the 10 Inch disappearing guns of Battery Warwick on Grande Island in Subic Bay dated 1st of March 1968 shown in the previous image. Zc707. This is the front page of the news paper The Afterburner, dated 1st of March 1068; this paper was put out by the Naval Air Station Cubi Point in Subic Bay. My friend Charlie Moser cut out the article and pictures and kept them now for 50 years because he was part of the story. Charlie is the person standing at right of the group of volunteer workers. Zc708. Wow, the crane had to be positioned on top of the casemate to be able to handle all the lifting. That is the Navy LT Gerald R. Stott from the staff of the Commander U.S. Naval Forces Philippines at the Naval Station Sangley Point. Zc709. That is my friend Charlie Moser HT1 DV doing his HT (Hull Technician) stuff. Most of his hair is gone now, though. 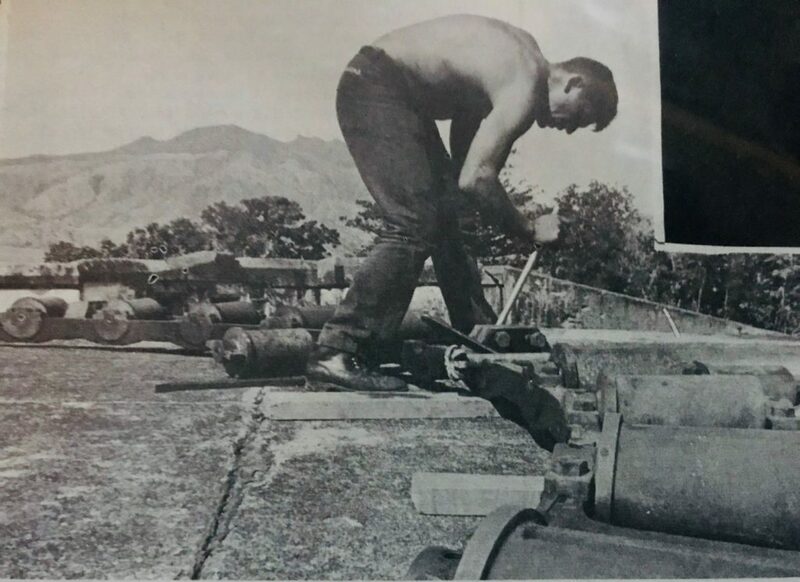 He was one of the Subic Bay Navy guys’ volunteers to dismantle the 10 Inch disappearing guns of Battery Warwick on Grande Island in Subic Bay dated 1st of March 1968. Zc711. This is picture #1 in the Cubi Point Naval Air Station news paper The Afterburner about dismantling the 10 Inch disappearing guns of Battery Warwick on Grande Island in Subic Bay dated 1st of March 1968. Attached are the picture descriptions of the pictures in the news paper. The next picture is the readable copy of the descriptions. Zc712. This is the readable copy of the descriptions about the pictures of dismantling the 10 Inch disappearing guns of Battery Warwick on Grande Island in Subic Bay in Feb. 1968. Zc713. 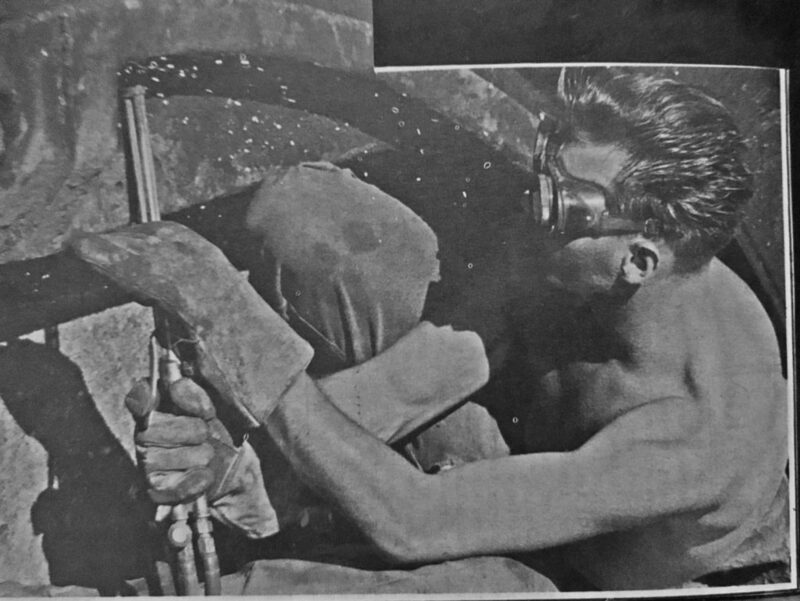 This is one other Navy volunteer dismantling the 10 Inch disappearing guns of Battery Warwick on Grande Island in Subic Bay in Feb. 1968. The mountains in back are the Redondo Peninsular forming the west side barrier of Subic Bay. Zc714. On the 20th of July 2018 Charlie and I visited Grande Island. We were welcomed by the present Grande Island Resort Management. Here we are standing at #1 Gun of the 6 Inch Battery Flake on Grande Island. From right to left are Charlie Moser, Mr. David DU the present manager, his son Chris Du and Karl Welteke. Zc715. This is the rear of Battery Warwick on the 20th July 2018; to the right is the position of No. 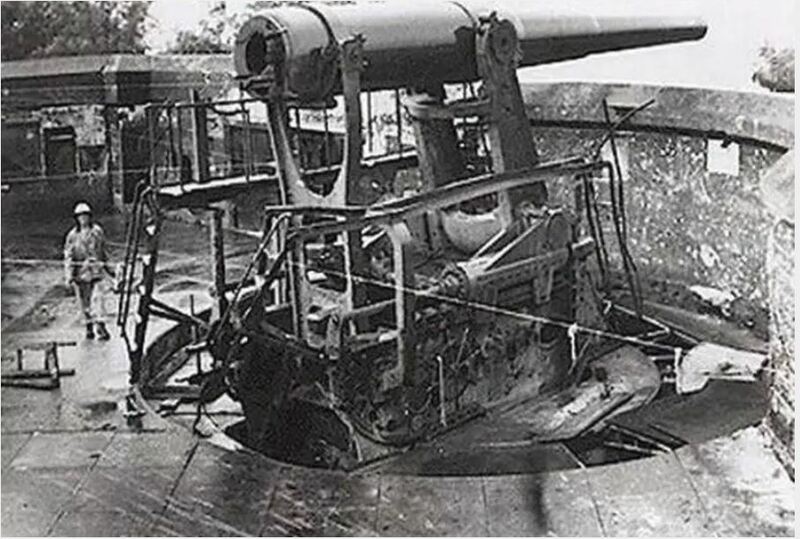 1 Gun of the battery. Zc716. We are standing at the gun-loading-deck next to the well of Gun No.1, Warwick 10 Inch battery. Charlie Moser is telling Mr. David Du. About how the guns were dismantled. Mr. David Du and his son were very much interested in the history of the island and wish to work a historical theme in the future resort operation. Zc717. 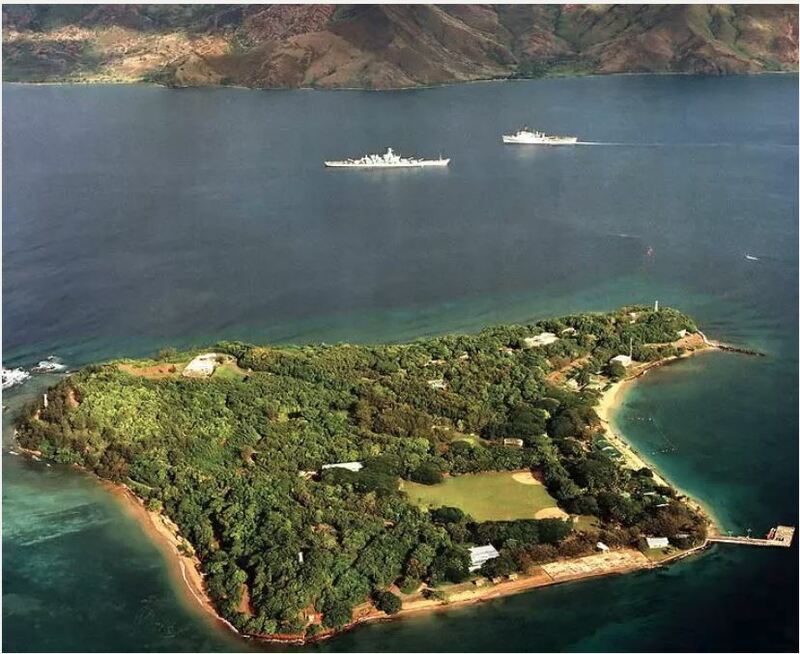 This is grand picture of Fort Casey and show the new home of the Big 10 Inch disappearing guns from Subic Bay. It was shot by a photographer for the Washington State Park Service, Bravo Zulu, and a great picture. 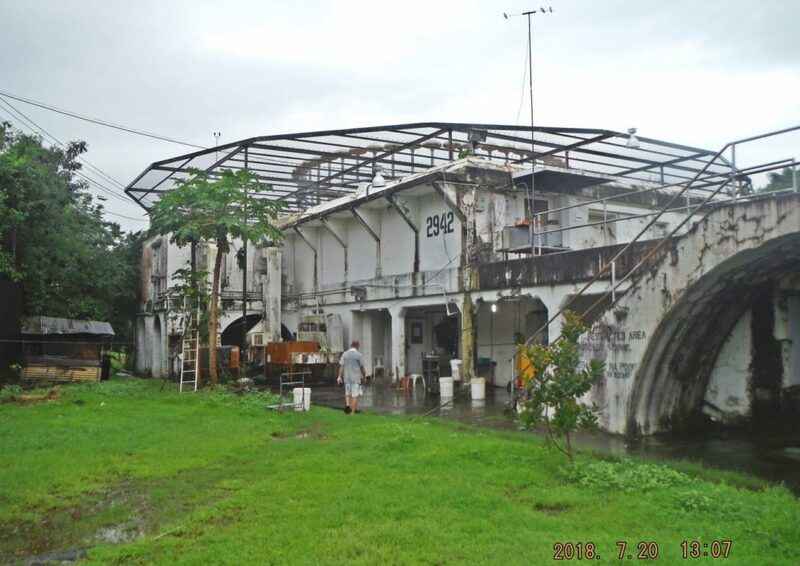 This is truly a great new home for the Subic Guns. Zc718. This is one of the 10 Inch disappearing guns at the Washington State Park, the former Ft. Casey, and the guns came from Subic Bay, from Grande Island, the former Fort Wint. 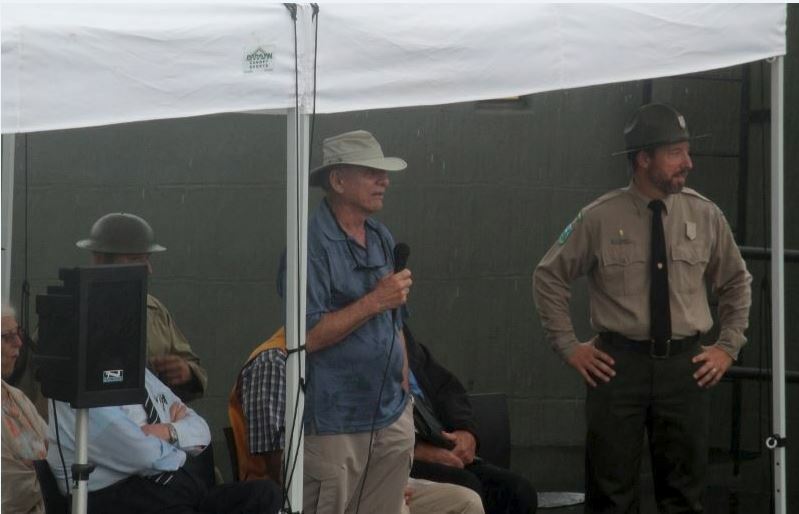 The Washington State Park Service was celebrating the 50th Anniversary of receiving those guns in May this year. Zc719. My friend Charlie Moser was speaking at the 50th Anniversary of receiving the big guns at the former Ft. Casey on the 11th of May 2018. He helped dismantle those guns 50 years ago as a Navy volunteer in Subic Bay at the Battery Warwick, Grande Island, and the former Fort Wint. Photo credit-Richard Slater.